It's been more than three months since the release of 5.10, and I'm still doing Ossus dailies with gusto. It's actually been somewhat surprising to me just how much enthusiasm I've been able to maintain for them, considering that I would never describe myself as a lover of daily quests, but whenever I'm not raiding, the two things I'm usually doing whenever I'm logged in right now is either PvP or trundling around on Ossus. I keep thinking that there are other things I want to do, such as finally getting the last two classes I'm missing through KotET, but as Wilhelm often says, there can be a difference between what we want on an intellectual level and what we actually feel like doing once we get down to business. I really like the thought of finally being able to say that I've completed the current storylines on one character of each class, but apparently my more primal urge is just to whack things whenever I log in. Oh well. I'm not quite as zealous about getting the quests done on every character every week as I was in the beginning (doing the same couple of world bosses over and over and over again was bound to get old after all) but I'm kind of surprised by how much I still enjoy the content anyway. I think a part of it is that I'm still playing ESO, but only really for the story (I've tried dungeons and PvP but haven't really found them all that engaging), and I've observed previously that a balanced MMO diet for me seems to consist of about equal parts story and character progression. For a long time SWTOR had the story thing down pat, while games like Neverwinter added a bit of supplementary character progression, but with ESO's quests filling my story quota at the moment (while failing miserably at providing me with a feeling of progression), SWTOR has to cover different ground, and apparently grinding Masterwork Data Crystals fits the bill. I'm not even sure why, because I don't really need the gear for anything, not to mention that I expect that we'll see a gear reset relatively soon, but I guess it's just a relaxed sort of fun. I feel that I've got doing the dailies in particular down to a proper art form by now. By splitting the weekly mission in two chunks of five quests instead of doing all ten at once, you can pick and choose your favourites and just do them two days in a row. On Republic side, I start in the Ossus Canyons by planting sensors and collapsing tunnels. I avoided the "Wasteland Terrors" for a while, because while it is technically the fastest quest to complete, this only applies if you're not competing for the spawns, and most of the time whenever I checked they were camped to hell and back. So I started doing the quest to scan the landmarks instead, even if that also required a quick detour to the Jedi Temple. However, more recently I've often found that the bugs were actually up when I rode past them, and then I'd kick myself for not having picked up the mission to kill them, so now I usually take it anyway and only resort to scanning things if there is a tiresome amount of competition. Either way that's three quests ticked off, at which point I quick travel to the farms to put out fires and erect some turrets, and that's that. On Imperial side, I start at the farms, with the two counters to the missions mentioned above (sabotaging equipment and destroying turrets) and also pick up the one to scan the area. Then I quick travel to the canyons to pick up the two quests there, just to immediately proceed to the Dead Forest. There I do the two quests I just picked up, to plant listening devices and reprogram excavator droids, and also finish the scanning daily. Boom, done even more quickly! While I'm doing these quests, I keep an eye on general chat and immediately whisper anyone building a group if they have a spot for whatever role I'm playing. If the group is still in the process of filling up, it's usually done by the time I've completed my quests. With two days of looking out for world boss groups per character the odds of finding one are pretty good, though I've set myself the rule to not fret if I don't find one in a particular week. Sitting around in the base just to wait for a world boss group is not worth it in my opinion. The world boss groups themselves have changed less than I would have expected. The droid is less of a death zerg these days, with most groups having figured out the trick with tanking him in the corner, however that also means that people have a lot less patience with tanks who don't get it right. I was in one group which had been taking way too long to fill up, when someone offered to tank, with the caveat that they were not at all experienced... yet this did not prevent the ops leader from going absolutely mental when things went wrong and there were some deaths, spewing abuse in ops chat in all caps over and over again. Almost makes me miss the death zergs; it seems to me that people were a bit more zen about dying then. Anyway, my point is that Ossus continues to provide plenty of entertainment to me. I realised that I've really been missing that feeling of having a new area that is "the place to be" for a while. As I mentioned in my retrospective on daily quests, the last time a planet made me feel that way was probably Yavin after the release of Shadow of Revan. Neither Ziost nor Iokath had quite the same appeal. Zakuul never gave players much of a reason to hang out there either, and Odessen was more trying to compete with the fleet than to be a place where you actually did things. I may want old content to maintain some semblance of relevance, but that doesn't mean that I don't enjoy it when new additions get you sufficiently excited to overshadow everything else at least for a while. Ossus is definitely one of my favourite Daily Zones in the game right now - it allows each player to define a route which works best for them while also allowing for a decent amount of flexibility. 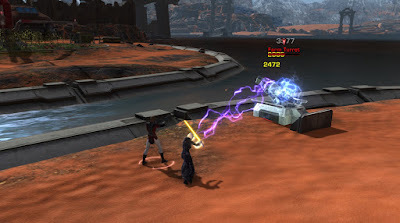 It mercifully doesn't go to the same extreme as Iokath, which also allows for flexibility but goes too far by not having the same missions appear every time. While the story work they did on Ossus is the best they've done in a long time, I wouldn't rate the dailies that high. I rate dailies based on how many people it takes to exhaust the nodes and cause wait times. On Ossus, too many quests are rated "1", meaning as soon as a second player shows up, you have problems. 1 rated quests cut into the flexibility you're referring to. You'll simply ignore those quests every day and end up doing the exact same "route". The "bad" quests will always be the "bad" quests. In the future I'd like to see them use instancing more, and design mob hit quests so that there's more than one available target on the map. The "bad" quests will always be the "bad" quests. I thought I said pretty much the opposite in my post! Hehe. Since the Wasteland Terrors in particular can be very good or very bad depending on the time of day and other people's choices. Adds a certain kind of dynamism. Wasteland Terrors isn't bothering you too much because you can get to ten per week without it. If you look at the quest design itself though, there are so many opportunities for this quest to make you feel bad about your life choices. You can be annoyed that you have to wait in line. You can ignore the line and then feel guilty because now you're "that guy/girl". So ask yourself if being annoyed is one of the goals you want for your entertainment product. Also ask yourself if you would ever want a quest like wasteland terrors to be REQUIRED for gear progression. SWTOR would be a better product if the dev team avoided these types of quests in the future. It's a challenge in problem-solving. If there are too many people competing for this quest right now, should I maybe try doing it at a later time? Attempt to group up? Switch instances? Adds a bit of spice to something that would probably be a bit boring and rote otherwise. I'm incredibly bored of the game, tired of the lack of content after the great Zakuul expansions. Ossus looked good but it only gave about half an hour of story content. That's simply not good enough. I was expecting something like the prelude to the Reven expansion but it's not even close. I can't argue that there's been a lack of content; I've talked about that subject in a couple of other posts in the past. But to me the Zakuul expansions weren't really that great... and I think at this point I'd rather have some really good stuff that engages me for a long time less often than monthly chapters that are a chore to replay on alts. "monthly chapters that are a chore to replay on alts"...exactly...i play Rise of the Hutt Cartel and Shadow of Revan on all of my alts, but as soon as i reach Knights-of, i skipp to Iokath and after that i jump right into the Ossus-Storyline. You just can't pause chapters..if something comes up, you have to start over the next day. Horrible.